Spacious and comfortable fish tanks don’t have to be desolate places, with no decoration whatsoever. On the contrary, you can find plenty of products on the market that will allow you to put your touch of style on the one you own and to make it look exotic and out of this world. Aquarium decorations have reached a point where they don’t look like plastic plants anymore, and you can even find castles, vases, and cool-looking LED gadgets to help you beautify your tank. With this in mind, we invite you to experiment with the options down below. If you’re looking for a way to transform your aquarium into a unique piece of decoration that will also appeal to your fish, this product can help you achieve that for a small price. It resembles a sunken UFO, it features lots of detail, and it can provide a haven for your pet fish whenever it feels scared. Moreover, it is created from environmentally safe materials, that won’t prove toxic to the fish in the long run. Water won’t damage the product, and due to its long life, you’ll be able to reuse it even if you change the tank at any given time. 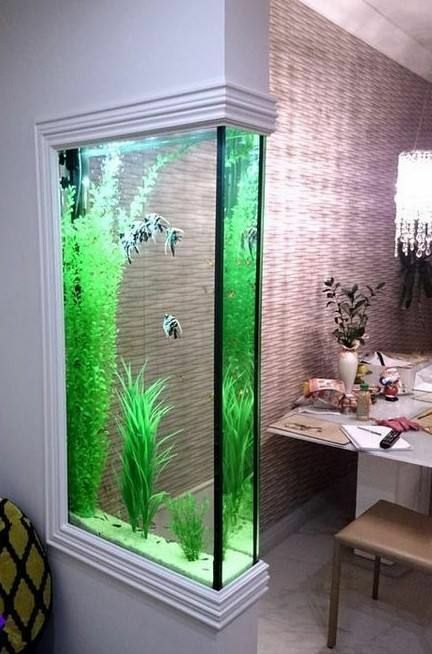 This aquarium decoration will turn heads. Made of non-toxic materials, it will become the ideal playground for your pet fish almost instantly. It is hand-painted and crafted from a quality resin which has colors that won’t fade away during use. The piece is compatible with all saltwater and freshwater types of tanks. It’s incredible detailing, doubled by the ancient rustic vibe, offers it an authentic, realistic look which stands out while also adding a touch of luxury to any home. Because it can help your pets hide, the item reduces fish stress which is very damaging to a fish’s health. SpongeBob fans will love this model. It is especially ideal for kids, but it can be offered as a gift to any age group because it is well-made and because it will bring some of the Bikini Bottom magic in every aquarium. The model can also be used as a fish house, for stressed-out pets. Like all premium items in this category, this one is made of a durable resin that’s safe for children and pets, and that doesn’t get damaged by saltwater. Plus, the pigments used for painting the pieces are discolor-resistant and lead-free. A giant grey castle like this, perched upon a rocky hill will look awesome in your tank, especially with water giving it a mysterious allure. Moreover, its cone-shaped roof, complex archways, and realistic stone details provide a genuine feel for enhanced user experience which matters to buyers. This model provides visual interest and stimulation for you and your pet. Its holes make hideaways for your fish to rest in but also passageways to reduce boredom, especially if you own just one fish. Additionally, the product is made from non-toxic materials, and it is safe for water use and the environment. Blue Ribbon created a piece that is a standout for those looking to make the tank look like a pirate’s treasure chest. The Skull mountain ornament brings a sense of adventure into any home and will make the fish behave like mini explorers. The product is safe for freshwater and marine wildlife, and it is hand painted for rich detail and a touch of uniqueness. Moreover, you can take advantage of its solid, one-piece construction, which features swim-through holes for your fish. It’s a product that comes with extended life and sturdy materials, all for your pet’s entertainment and happiness. A neat tank ornament like this can be offered as a present and even used as a decoration outside of the aquarium. It resembles a battleship, and it has fresh colors, that your fish is going to enjoy a lot. Moreover, its coating makes it ideal for saltwater, and its action won’t weaken the material in time. That being told, it can also be used for freshwater tanks, and it will help you if you want to add a shipwreck theme to your aquarium. Additionally, the piece is lightweight and can be moved around with ease so that you can find its perfect location. This is another multi-colored product that fish are going to find fun to explore. It comes with the brand’s stamp of quality, and it has the perfect dimensions for many breeds and tank types. Each piece is tested, so it respects the highest-quality standards and to make sure it is a fit home for your pets. The materials the vase is created from are safe and non-toxic, and the color pigments are persistent. It looks like something taken out of a history book, and it will make a statement in your house, which will impress all your guests. A castle is a tank decoration that will never run out of style. And if you’re a fan of Harry Potter, you can even imagine that it is Hogwarts and your fish is flying on a broom. It shows off your geeky side while being a cool decoration. The aquarium ornament is 8 inches wide and 10 inches high, and it is doubled sided, meaning can be placed anywhere in the fish tank. Additionally, it is crafted from resin, to make it durable and safe for its intended purpose. Details are ensured by the fact that each piece is hand-painted. Dragon skulls are not your typical tank accessory. But this product is good-looking enough that it could change that. It is for sure a bold statement, but for the right fish owner, it can be a nice addition that’s a proof of his or her aesthetic sense. Each piece of the product is safe for the pets, including the eyes, and it can be placed in both salt and freshwater tanks. It is not heavy, and its footprint is compact enough that it can fit in most types of aquariums. Your fish will have a great time exploring the item. If you lack plants in your tank, but you also want some sort of hiding place for your fish, this model can offer both of those for a good price. 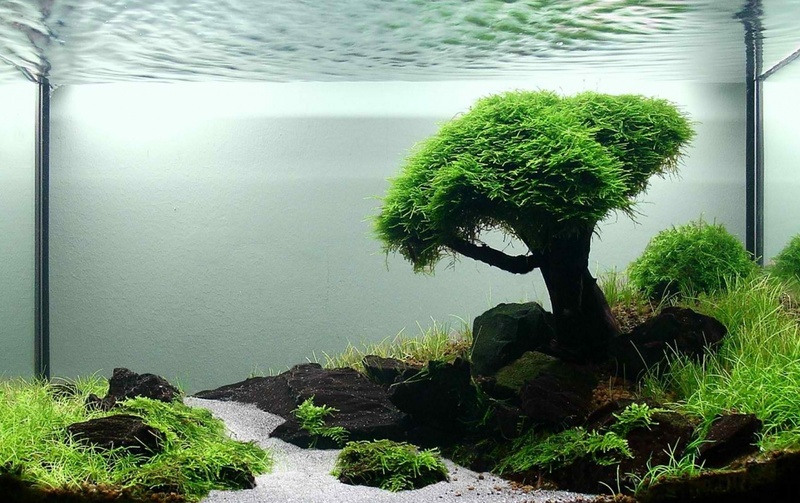 It resembles a traditional cage, with green plants around it, to mimic a fish’s natural environment and to make it feel comfortable in the tank. Safe and non-toxic for the water and for the fish itself, this is an environmentally-friendly choice that will last you for years. Plus, it also features a natural and realistic appearance which will trick many into thinking they are actually real-life plants which can enhance the user’s experience. Decorating a fish tank is not as easy as one might think. The most important aspect that makes the job dreadful is the fact that the market is filled with a myriad of similar products that are up for sale. Nevertheless, a fish lover’s possibilities are even larger as the internet also contains a significant number of DIY projects that one can put into practice whenever in search for new ideas. Because we understand how difficult it is to go through all the information made available online, we have decided to help pet fish owners out. Consequently, we have put together a list of features and information that you might find useful when trying to find new aquarium decorations. In order to create a beautiful looking home for your beloved pet fish, the first thing that you should pay attention to is the substrate of the aquarium. Although it is a well-known thing that not all fish actually require a substrate, this part of the unit is important as it can be transformed into a key piece of the overall construction. From this point of view, one usually has two distinct options: sand or gravel. If you decide to opt for sand, you should know that you can either choose a pale tan colored model that will make the aquarium look natural, almost ocean-like or, you could go with colored sand and construct a futuristic looking unit. Even more so, you should know that sand is recommended if you own a ray, a knifefish or an eel. However, you can use this type of bedding for all types of fish. Still, the main disadvantage that this kind of substrate has is the fact that it is pretty difficult to clean (because it is easily absorbed in the cleaning tube, it needs replacing quite often). Nonetheless, if you decide to pick gravel you should know that this substrate can also be purchased in various colors. Additionally, most specialists recommend gravel as it is quite effortless to take care of it. For a more interesting effect, you could use different colored gravel and create distinct layers. This way, your aquarium will look more impressive. Moreover, it is recommended that you settle for medium sized gravel that has smooth, even round edges so that your fish won’t get hurt. Large pieces of gravel should be avoided as they can actually trap fish and food under them. If you aren’t fond of having to do minute cleaning, we recommend that you simply do not use any type of substrate. Another thing that you should do while browsing through cool fish tank decoration ideas is to pick a theme for the unit and then stick to it throughout the decorating process. The easiest way to do so is by selecting the type of rocks that you want to use. From this point of view, it is crucial that you go to the nearest pet shop in order to select the rocks that best fit the space that you have available as well as the chosen theme. Moreover, whenever you so so, it is recommended that you actually verify and make sure that the rocks are safe to use in the aquarium. Apart from checking for rough edges, specialists recommend that one tests whether the chosen models are acid or not. Similarly, before you decide to place the rocks in the tank, it is best that you thoroughly wash them. Similarly, now is a good time to add shells, plastic or live plants, etc. Yet, we believe that it is prudent that we remind you that the plants that can live in freshwater often have difficulties adapting to salt water. So, make sure that you check for specific details before you make a purchase. If you are a fan of crazy fish tank decorations and you are not afraid of making an investment, our advice to you is that you check out a few cool ideas that can be purchased from online stores. For instance, if you are a fan of the famous SpongeBob SquarePants cartoon, you might be happy to find out that you can purchase plenty of related accessories. Similarly, you could buy interesting jellyfish replicas as well as Finding Nemo tank decorations. As a plus, if you are interested in goldfish tank decorations, we suggest that you check out the numerous shipwreck ornaments that are currently available. Besides, if you want to gift the aquarium to a child, we believe that it is fit that you actually ornate the tank using hand-painted models that depict pink princess castles, the little mermaid or even Mickey Mouse. Still, if you intend to offer the aquarium as a gift to an adult, we suggest that you include plenty of ornaments that remind him/her of his/her favorite TV characters and/or shows. For example, with a little bit of patience and inspiration, you can actually design a Game of Thrones inspired aquarium. Likewise, there are plenty of Hogwarts fish tank castles that you can also purchase from online stores. So, don’t waste any more time and start designing! All in all, we believe that if you follow the already mentioned suggestions you will surely be able to construct an eye-catching, interesting design that everybody will find fascinating. Still, before anything, make sure that all the chosen products and ornaments are safe and that they won’t cause any type of disease or harm to your pet fish. Additionally, if you have doubts about a certain product, it is best to ask for specialized help. Similarly, if you purchase certain items online, go ahead and see what previous buyers had to say about their quality and safeness beforehand.